Thanks to Raquel from Gratis Total - the Spanish fashion blog, our intrepid correspondent, for her latest installment of Iberian Cycle Chic. This time from San Sebastian. Thanks to Rhys, in Manly, Australia, for these photos of bicycle culture in his town. Featuring his Danish girlfriend on the left. The very latest shots, hot off the bike lanes, from our friends Witold and HuBar at Lodz Cycle Chic in Poland. Thanks to our reader, Will, for these cracking shots from Mardi Gras in New Orleans. And thanks to Kristoffer for these great shots of our neighbours in Stockholm. eh....so much for cycle chic. Please don't ram the financial crisis down our throats in every which direction we turn, give us a break and leave us a few inches of free space to breathe beauty, thanks! Just gotta love the anonymous urgent messenger kind of guy. Maybe "Anonymous" #1 thought this place is all about the "down cycle" - who knows? 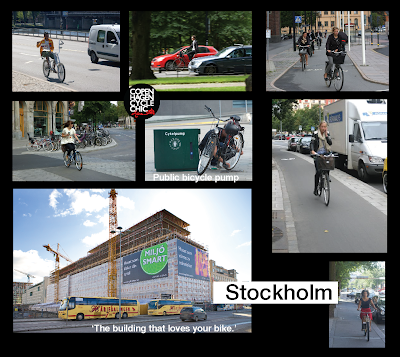 If I may be so presumptuous as to pass judgment on the cycle-chicness of the photos, I think I would vote for the Stockholm pictures as the best, both for the smart streetwear and the sensible bikes, as well as for the excellent cycling roadways. After that, the Basque city of Donostia (San Sebastián in the pictures): smart clothing, smart bikes, though the narrow two-way painted bike lane could be improved on. The Łódź ones are just about equal with their friends off to the southwest, I think. OK, maybe I'm being too critical here... so what are other people's preferences? Kiwehtin, the Mardi Gras people are simply using the bikes to help stay vertical. San Sebastián (Donostia) is my fave on the style scale, Lodz not far behind, Stockholm also well up there. Australia (Sydney - Manly!! ) lagging well behind, especially in the male section. But I am impressed with his surfboard-holding technique. Has the guy got a third, mega-long arm? The woman is perfect, but she's Danish so that's only half a point for Australia there. Mardi Gras sort of fits into another category, doesn't it? Not sure which, but SOME other category.